Circular Memo. No.3856-A/29/A2/HRM.V-PC/2014-1. Dated: 23-6-2015. 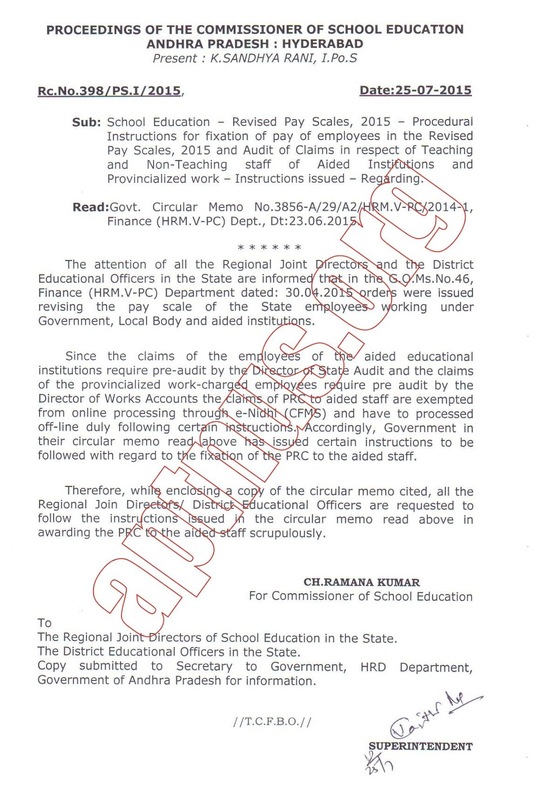 Sub:- PUBLIC SERVICES – Revision of Pay Scales, 2015 – Procedural Instructions for fixation of pay of employees in the Revised Pay Scales, 2015 and Audit of Claims in respect of Teaching and Non-Teaching staff of Aided Institutions and Provincialized Work-charged Employees – Instructions – Issued.Ref:- 1. G.O.Ms.No.46, Finance (HRM.V-PC) Department dated: 30.04.2015.2. G.O.Ms.No.47, Finance (HRM.V-PC) Department dated: 30.04.20153. G.O.Ms.No.48, Finance (HRM.V-PC) Department dated: 30.04.2015.4. G.O.Ms.No.49, Finance (HRM.V-PC) Department dated: 30. 04.2015.5. Circular Memo. No.3856-A/29/A2/HRM.V-PC/2014, Dated: 26.5.2015.6. G.O.Ms.No.67, Finance (HRM.V-PC) Department dated: 12.06.2015.7. G.O.Ms.No.68, Finance (HRM.V-PC) Department dated: 12.06.2015.8. Circular Memo. No.5375-J-A/29/TA – A&L/2015, Dated: 18.06.2015.
d) The salary in the Revised Pay Scales, 2015 would be paid in cash from the month of April, 2015 payable in May, 2015. The principles of fixation of pay in the Revised Pay Scales, 2015 were notified in the Government Order first cited. 2. In the reference second cited, orders were issued regulating the rates of Dearness Allowance from 01.01.2014 and 01.07.2014 in the Revised Pay Scales, 2015. Similarly, in the orders third and fourth cited orders were issued, revising the rates of House Rent Allowance and City Compensatory Allowance respectively as recommended by the Tenth Pay Revision Commission. In the reference 6th, 7th & 8th cited orders were issued regarding Stagnation increments, Automatic Advancement Scheme and Special Pays and Allowances respectively. In the reference fifth cited instructions were issued for fixation of pay in the Revised Pay Scales, 2015 under the e-Nidhi (Comprehensive Financial Management System). i) The Head of the Institution/ Head of the Office shall prepare the pay fixation Statements, in quadruplicate in the form appended Appendix-I. Part I: From 01.07.2013 to 01.06.2014 for which the fixation is notional. Part II: From 02.06.2014 to 31.03.2015 for which the arrears of Pay fixation in Revised Pay Scales, 2015 are to be paid as per the orders that will be issued separately. Part III: From 01.04.2015 onwards the date of fixation of pay in the Revised Pay Scale, 2015 for which the arrear shall be paid in cash. iii) The claims on account fixation of pay in the Revised Pay Scales, 2015 shall be preferred in duplicate in the establishment pay bills form and presented to the Audit Officer of the State Audit Department in case of Teaching and Non- teaching staff of Aided Institutions and to the Assistant Pay and Accounts Officer/Pay and Accounts Officer (Works) in case of Provincialized Work Charged employees, along with pay fixation statements in triplicate together with the Service Register of the individual concerned together with update entries. The bill should be superscripted in RED INK as “Claims for Pay fixation arrears in the Revised Pay Scales, 2015” to make it distinct from other bills. iv) The employees shall be informed as to how much arrears of Pay fixation in the Revised Pay Scales, 2015 are adjusted notionally; will be paid to the employees after issue of orders and amounts paid in cash in the proforma appended to (Appendix II) to these instructions. v) If the Audit Authorities report any erroneous pay fixation, the pay fixations shall be checked again and pay fixation shall be rectified immediately. vi) The columns of the pay fixation Statements should be altered or any new item shall not be included. ii) After obtaining the list in Annexure -I the Audit Authorities shall verify whether pay fixations are in accordance with the orders issued in the GO first read above. iii) The pay fixation claims from 1.7.2013 shall be checked with reference to the entries in the Service Registers and then only the bill will be admitted. iv) After such verification, the officers shall record in column (5) of Annexure I, the result of such pay fixation and attest the entries. v) In case any erroneous pay fixation is detected, the audit authorities shall note the details of the erroneous pay fixation in the proforma indicated in Annexure II to this Memo. vi) The audit authorities shall report the number of cases, where pay fixation have been completed and the erroneous fixations to the Director of State Audit/Director of Works Accounts by 10th of the succeeding month. 4. All the Heads of Departments are requested to issue necessary instructions to the Departmental Officers under their control to follow the above instructions scrupulously and co-operate with the Audit Authorities. 5. Any further clarification in this regard can be sought from the Finance (HRM.V- PC) Department.